Sustainable Couture proved itself again last night, with renewed inspiration from its core group of designers and inspired new designers entering the fray. The group’s commitment is to making wearable garments with flair, using recycled materials. First time exhibitor at the event, Jen Standish-White, wowed the crowd with this elegant trio, her sleek male models getting a particular welcome. At left: Hayden, Nathan and Megan modelling; Jen Standish-White at the rear, far left, with MC Meredith Campbell. Immaculate construction and sewing and the choice of beautiful natural fibres revealed her background in the fashion industry – a 20-year career in Zimbabwe before migrating to Australia. Here she left the profession behind until last year when she collaborated on a prize-winning design in the annual Wearable Arts Awards. It restimulated her passion, just as it looked like this enduringly popular event, which began in 2002, might disappear from the Alice calendar (its host Alice Desert Festival having changed its focus). Standish-White, however, told last night’s crowd that Central Craft, of which she is the Executive Officer, will take over the management of the event, staging it at Araluen on October 26. A glimpse of what is to come wound up last night’s parade, with an audacious Georgie Yovanovic, as a Black Swan, Bird of Paradise, and proud Peacock, stripping away his many-layered plumage. At right: Georgie Yovanovic modelling his own creation. 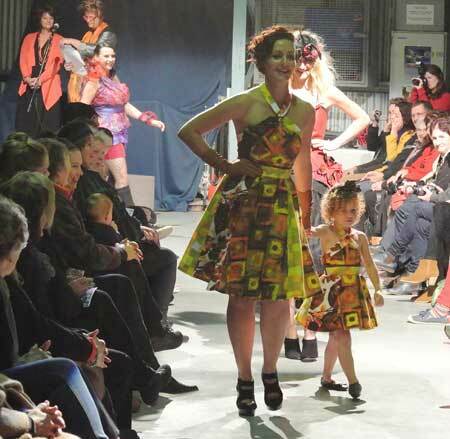 Beforehand, we’d been taken back to Sustainable Couture’s roots – in the 2008 Wearable Arts Awards – when Franca Frederiksen created a funky, very wearable little suit from an old grey blanket. It again got an outing in last night’s show. Her new entries were more romantic, taking their cue from a book about husband-hunting in the Raj, The Fishing Fleet. She designed a party dress, a fanciful outfit for elephant-riding with the Viceroy, and for the sought-after happy ending, a wedding dress. You’d never suspect from the results that she’s used old sheets and curtains as her foundation, although she allowed the vintage pink damask bedcover to shine through in its new form. More curtains featured in Carmel Ryan’s presentation, with a matching mother and daughter retro halter dress. Her approach is usually to deconstruct and reconfigure, but with her gorgeous red and black silk cocktail dress, she said she couldn’t bear to cut into an old Perri Cutten jacket. So she turned it upside down, even retaining the collar as a feature on the back of the skirt. Its restructuring as all by stitching – no cutting. Above: Simone Guascoine’s cabaret singer, daughter Dagmar modelling. Below: Carmel Ryan at rear, far left; daughter Kate modelling together with little Ava, daughter Emily and niece Lisa-Marie behind them. A pair of double bedsheets were the foundation for Simone Guascoine’s wonderful development of a riding coat to adorn a cabaret singer. Two sleeves of an old jumper made for a sweet child’s dress by Philomena Hali. Champagne bottle corks were Jen Standish-White’s signature buttons. The crotches of old jeans were used as sculptural embellishment on a denim cape by Julie Millerick. Sarah Hill did some lovely work with feathers on the bodice of a simple black dress. Darwin-based Mandy Peters used devotional imagery and objects – prayer flags, rosaries etc – to proclaim her “religion of kindness”. And more than one designer made use of the beautiful silks of old saris, with Kathy Frank nuno felting hers, creating a new fabric that is like an after-image or impression of the original, in colour and texture.